The wrinkle-faced bat's strangely shaped skull gives it a remarkably strong bite force, say scientists. 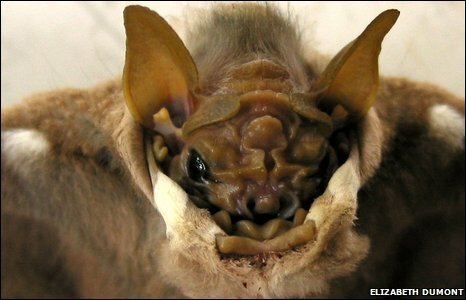 Researchers report in the Journal of Zoology that this bizarre-looking bat has evolved a powerful bite that may give it an advantage over other bats. It allows it to eat a broader range of foods than other small fruit-eaters with weaker bites. The tiny creature, which weighs just 17g, produces bite forces up to 20% higher than other bats of similar size. The Centurio senex bat has a extremely short and wide skull, the shape of which has long puzzled evolutionary biologists. "We found that relative to head size, Centurio generates the strongest bites known for any fruit-eating phyllostomid (or leaf-nosed) bat," explained lead author Elizabeth Dumont from the University of Massachusetts Amherst in the US. They proposed that a shortage of softer fruits during "lean times" may have provided a selective pressure, driving the evolution of its oddly-shaped skull. 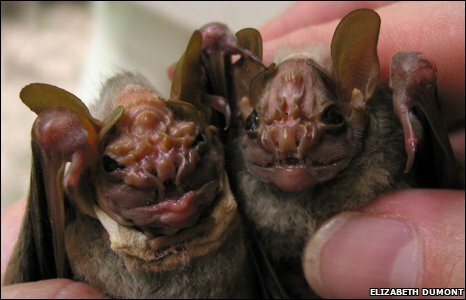 "The New World leaf-nosed family of bats exhibits spectacular diversity in diet," explained Professor Dumont. "Centurio is a dedicated fruit-eater, but the family also contains insect-eaters, nectar-feeders, species that eat small vertebrates - such as lizards, frogs, rodents - and vampire bats. "Although Centurio looks ferocious, it is a small and gentle animal."